Babies are supposed to smile and coo before drifting off to sleep in your arms, so ending up with a baby that screams blue murder for hours at a time, for no apparent reason, is enough to drive even the most laid-back parent to the brink of insanity. And if this is your first child, it is even harder to cope. Colicky babies are a nightmare. The crying bouts can last for a few hours, or even all day, with very little respite. Your little one might eventually fall into a fitful sleep, only to be woken again by a barking dog or noisy toddler. Yes, it’s a difficult time, and for some parents with no access to help and support, trying to cope with a colicky baby can put a huge strain on their relationship at a time when everyone is supposed to be deliriously happy. All babies cry, but colicky babies cry a lot more than most and their crying cannot be explained away by a wet nappy, missed nap or hunger. The underlying cause of colic is not really understood. 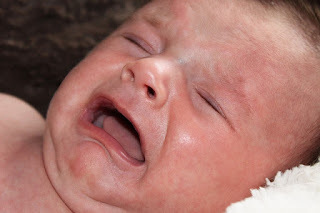 Some experts think the extended bouts of inconsolable crying associated with colic are caused by digestive upset whereas others believe the problem is an immature nervous system. · Carry your baby around in a papoose carrier all day – Instead of putting your baby down when you are not feeding him, carry him around all day long. Babies love the extra closeness and many are calmer as a result. · White noise CDs – Babies are often soothed by white noise such as washing machines and vacuum cleaners, but if you don’t want your washing machine on 24/7, buy a white noise CD instead. · Baby massage – Place your baby on a soft towel in a warm room and then massage him gently using massage oil. He’ll find it soothing and will probably go to sleep. It is only natural to feel like a complete failure when nothing you do consoles your screaming baby. Modern parents put themselves under enormous pressure to create a happy family home and when something goes wrong, they usually blame themselves. However, it is not your fault and you are not alone: millions of other parents are going through the same trials and tribulations with you. Help is out there, but you need to ask for it. Coping with a screaming baby all day and night is torture, so try and persuade a friend or relative to look after your baby for a few hours so you can have a mental and physical break. Alternatively, look for support online in parent forums. Just knowing that other parents are going through the same thing will help enormously. It is hard to stay calm when your baby is screaming his lungs out, but remember that this difficult period won’t last forever. However, if you do start to feel agitated, put your baby down safely in his cot and leave the room until you feel better able to cope.